Alternatively, you can delete a calendar event from the event view page by clicking the Delete button in the upper-right corner of the event view page. Entity records that are specified in a calendar event context have the event displayed in the Activity sections of their view pages. 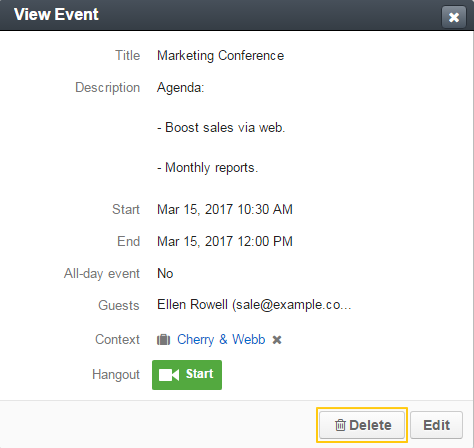 In the Activity section, click the ellipsis menu at the end of the row with the event you would like to delete and then click Delete Calendar event. On the View Event calendar card, click Delete.